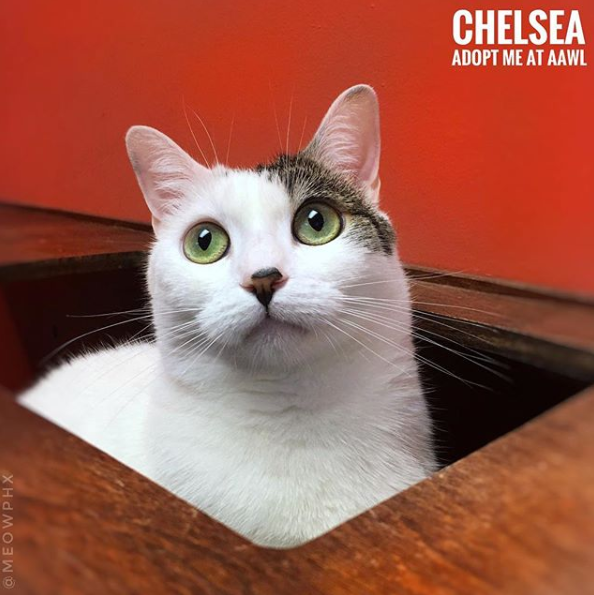 Chelsea, you know I love you, we’ve spent the last two years together at the shelter! I’ve brought you treats and new toys, we’ve hung out writing emails. I’m allergic to cats, and I take drugs so I don’t miss my time with you. We’re friends. 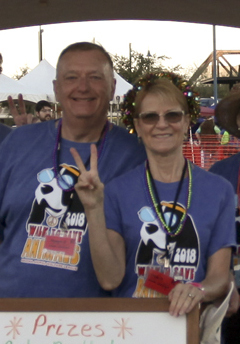 We have another dynamic duo of volunteers to spotlight this month: Ali G & Mary C! Ali has been with AAWL since 2016 and has given 325+ hours of service. Mary has been with us since 2015 and has given 850+ hours! 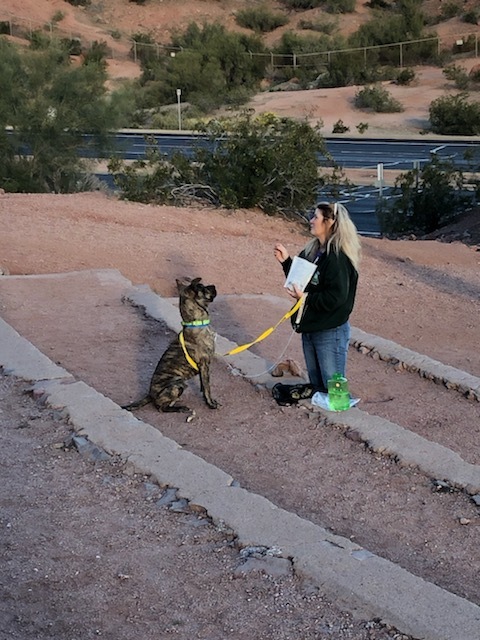 These two give so much of themselves to our shelter dogs in so many ways including our weekly hikes, Playgroups, Mentoring, our Champion program and more! 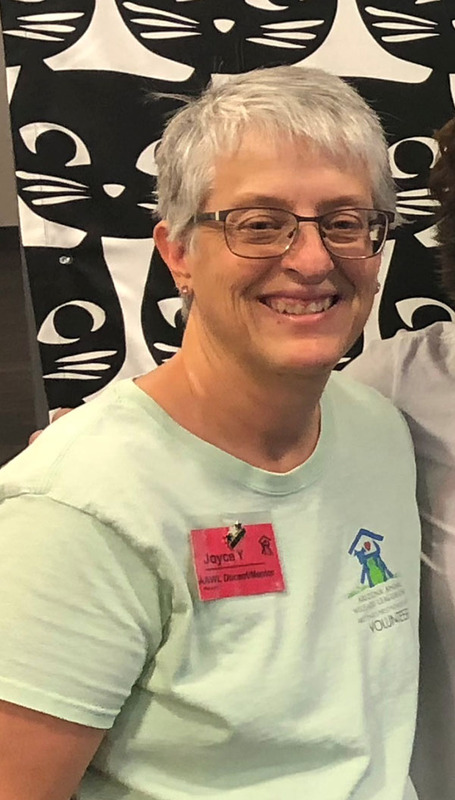 Our Chandler Mall Adoption Center would surely be hurting without volunteers like Karen B. Karen has been volunteering at the Mall Adoption center ever since the glorious day we took that storefront over from a puppy mill pet shop in 2012 and has given nearly 1,000 hours of service since! Karen is an excellent caretaker for our animals and always ready to pitch in whenever we are in need. We can rest easy knowing that every Sunday, Karen will be there, not only taking care of our animals, but keeping an eye out for the Chandler Mall staff as well! 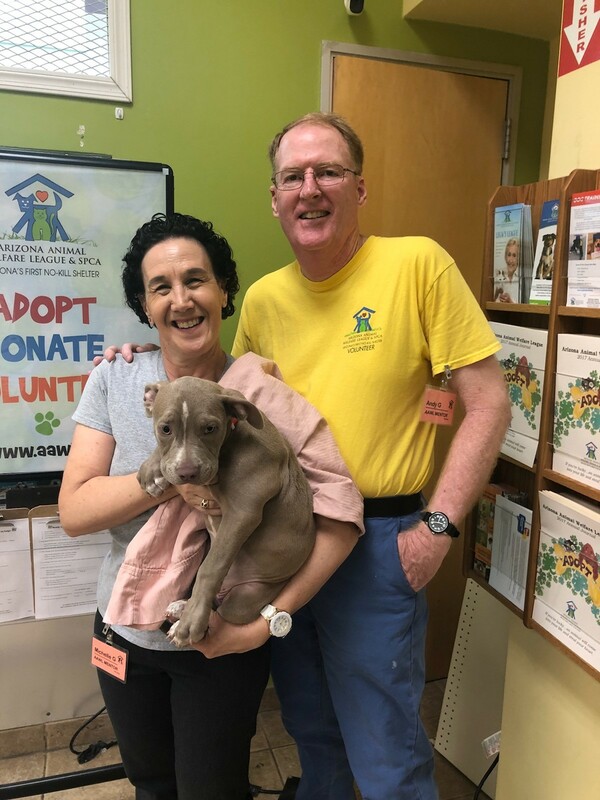 Joe and Vicki D – another Dynamic Dou to volunteer at AAWL! Have we mentioned how much we love when couples, friends, siblings, etc volunteer together? Well , we do! The husband and wife duo of Vicki and Joe are no different. They have dedicated their time to AAWL for going on three years, collectively giving over 1,300 hours of service. We had an incredible 2018, thanks to you! Your support made us stronger together: We saved more lives, made more families, helped more youth campers, visited more schools, and spread the word of adoption and animal welfare across the state. Read our impact report, see the difference you made in your community, and get ready for an even better 2019! Joyce is a truly wonderful human, not only at the shelter but in her regular work hours as well. She has dedicated her career to special needs children working as a teacher’s assistant. She also runs marathons and is a talented artist! Since 2013, Joyce has spent over 1,500 hours volunteering at AAWL (WOW!). Through thick and thin she has been a vital member of our Cattery team. When asked about the sorts of tasks Andy & Michelle G help out with around the Chandler Mall Adoption enter, Katlyn Riggs, the Adoption Center Manager, said “What do they NOT do?? They are incredible! They are reliable and basically do everything! Manny M. has been a volunteer for only 7 short months but has already logged more than 400 volunteer hours! He truly found his “place” when he landed at AAWL and we couldn’t be more thrilled to have him as part of our volunteer family. Manny has achieved one of the highest rankings when volunteering with our shelter dogs, a K3 volunteer, and is also a Mentor to new volunteers and a Playgroup Lead. For some volunteers coming into the shelter can be an overwhelming environment that can leave people feeling lost. Manny is not one of those volunteers!